SWD Notification is out. SWD is recruiting for 35 Anganwadi Worker, Mini Anganwadi Worker And Helper Govt Job Posts. 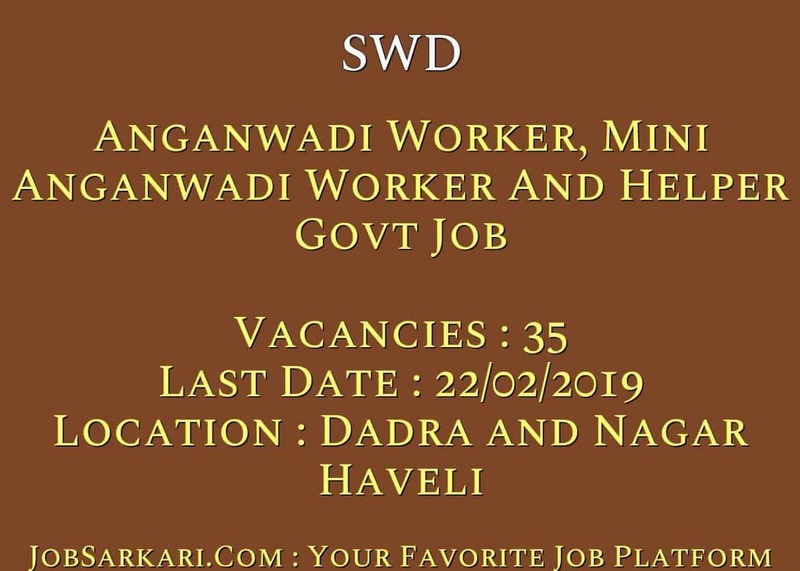 You can check SWD - Social Welfare Dept last date, download SWD notification, visit SWD official website and check other SWD Vacancy details.Complete Vacancy and recruitment Details about 35 Anganwadi Worker, Mini Anganwadi Worker And Helper Govt Job vacancies in SWD are provided below by JobSarkari.Com only for you. Last Date for Receipt of Application Form. 22/02/2019. Date of Interview. 23/02/2019 and 25/02/2019. Total No. of Post 35. Candidate Must Have Passed Class 10th (SCC) with 60% Marks. 2. Candidate Need to Download Application Form Given in Important Link Section. 5. Child Development Project Officer's Office Third Floor Accounting Building Silvassa On or Before 22nd February 2019. 6. Candidate Have to Go For Interview to the Address Given Below. 7. Accounting Bulding Third Floor Dadra Nagar Haveli Silvassa on 23 February 2019 and 25 February 2019. Q. What is the Last Date For SWD Anganwadi Worker, Mini Anganwadi Worker And Helper Govt Job Vacancy ? A. 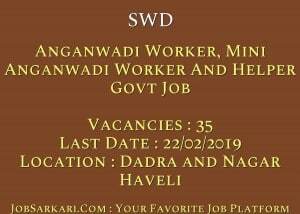 Last Date for SWD Anganwadi Worker, Mini Anganwadi Worker And Helper Govt Job Posts is 22/02/2019. Q. What is the Form Type of SWD Anganwadi Worker, Mini Anganwadi Worker And Helper Govt Job Recruitment ? A. The Form Type for SWD Anganwadi Worker, Mini Anganwadi Worker And Helper Govt Job Posts is Offline. Q. How many vacancies are available in Social Welfare Dept Anganwadi Worker, Mini Anganwadi Worker And Helper Govt Job Posts ? A. There are about 35 Vacancies in Social Welfare Dept Anganwadi Worker, Mini Anganwadi Worker And Helper Govt Job Posts. Q. What is the Full Form of SWD ? A. Full Form of SWD is Social Welfare Dept .